Phototropism is growth in the direction of light. Phototropism is common in plants, but can also occur in other organisms such as fungi. The cells on the plant that are farthest from the light have a plant growth hormone called auxin, which causes phototropism to occur. It causes the plant to have elongated cells on the farthest side from the light. Phototropism is one of the many plant tropisms or movements which respond to external stimuli. Growth towards a light source is a positive phototropism, while growth away from light is called negative phototropism. Most plant shoots have positive phototropism. Roots usually have negative phototropism, though gravitropism may play a larger role in root behavior and growth. Some vine shoot tips exhibit negative phototropism, which allows them to grow towards dark, solid objects and climb them. Auxin collects mainly on the darker side of the stem and stimulates cell elongation. Thus, the cells on the side not directly exposed to light will grow faster than the opposing side, and the stem will curve towards the light source. 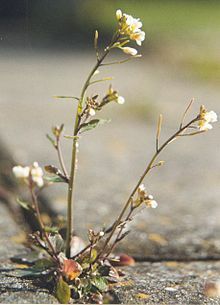 Phototropism in plants such as Arabidopsis thaliana is directed by blue light receptors called phototropins. Other photosensitive receptors in plants include phytochromes that sense red light, and cryptochromes that sense blue light. ↑ "American Society of Plant Biologists". ↑ Eckardt, Nancy A. (1 May 2003). "A Component of the Cryptochrome Blue Light Signaling Pathway". The Plant Cell 15 (5): 1051–1052. doi:10.1105/tpc.150510. http://www.plantcell.org/content/15/5/1051. This page was last changed on 14 February 2019, at 13:43.